There will be no classes Monday 8 October, 2018 due to parent-teacher conferences. Our school is pleased to announce that nominations for gifted and talented students are being accepted until September 21 for grades 3-5. Please find information about our response to asbestos by clicking on the link below. Favor de informarse del manejo de asbestos al hacer click en el enlace. Please find information concerning pest management at our campus by clicking on the link below. Favor de informarse del uso de pesticidas en nuestra escuela al hacer clic en el enlace. Please click on the link below to view the list of school supplies for the 2018-2019 school year. Please find the attached letter from the AISD superintendent regarding safety. Favor de leer la carta adjuntada del superintendente sobre la seguridad. There will be no classes for students Monday 9 October 2017 to allow for parent-teacher conferences. Thank you Elks Lodges #1631 and #1254! Central Star Elks Lodge #1631 and Texas Temple #1254 send Diane and Michelle with hundreds of Box Tops for Education to Andrews Elementary!! Thank you, Springdale HEB Buddies! HEB donates lunch bags to staff and backpacks and school supplies for students...Thank you HEB Buddies!!! Congratulations to Ms. Delgadillo for being selected as a Teacher of Promise for Andrews for the 2016-2017 school year!! In her first year at Andrews (and as a teacher), Ms. Delgadillo has shown tremendous skill and enthusiasm towards teaching her kindergaten class. Andrews student recognized for his poetry! Andrews is very proud of Daniel Lucero, who earned the Dean's award in the Vision and Voice poetry contest! Congratulations, Daniel! 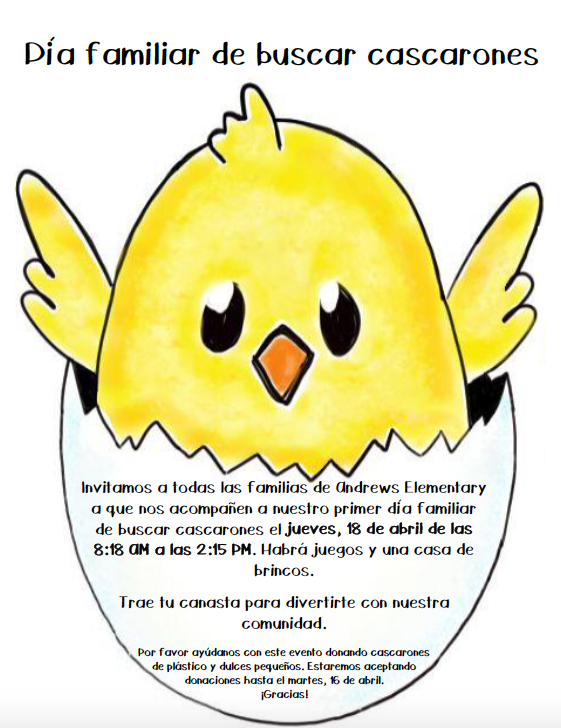 Andrews is one of several AISD schools that serve breakfast in the classroom to all students grades PK-5.